This obligate carnivore has no trouble sleeping. Do you have trouble sleeping? If so, it may be time to re-evaluate your diet. 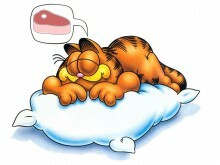 A study published in Medical News Online revealed that carnivores sleep more than omnivores and herbivores. This doesn’t exactly surprise an unvegan who still regularly sleeps for 12 hours on the weekends, but may come as a surprise to someone who struggles with sleeping.